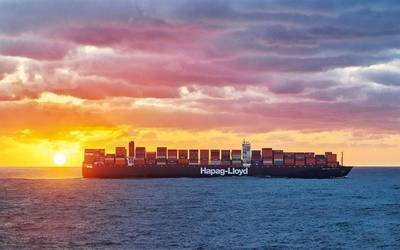 German ocean carrier Hapag-Lloyd expects solid growth in 2019, according to the annual report for 2018 in which the the international container shipping line reports improved earnings. In its most recent economic outlook for the year 2019, the IMF expects a global economic growth of 3.5 % and global trade volume to increase by 4.0 %. Hapag-Lloyd is anticipating a rise in the transport volume in 2019 in line with the general growth of the market. Additionally assuming a lower increase in global transport capacity compared to 2018, Hapag-Lloyd’s average freight rate in 2019 is likely to increase slightly compared with the previous year. Hapag-Lloyd is also expecting the average bunker consumption price in 2019 to be moderately higher compared to the previous year. Provided that Hapag-Lloyd achieves the expected freight rate, the anticipated improvement in revenue quality combined with the cost savings as part of Strategy 2023, and the expected growth in volumes, it is forecasting an EBITDA in the range of EUR 1.6 to 2.0 billion and an EBIT in the range of EUR 0.5 to 0.9 billion. Accounted for here is the currently expected impact on EBITDA in the range of EUR 370 to 470 million as well as EBIT in the range of EUR 10 to 50 million related to the implementation of the reporting standard IFRS 16.